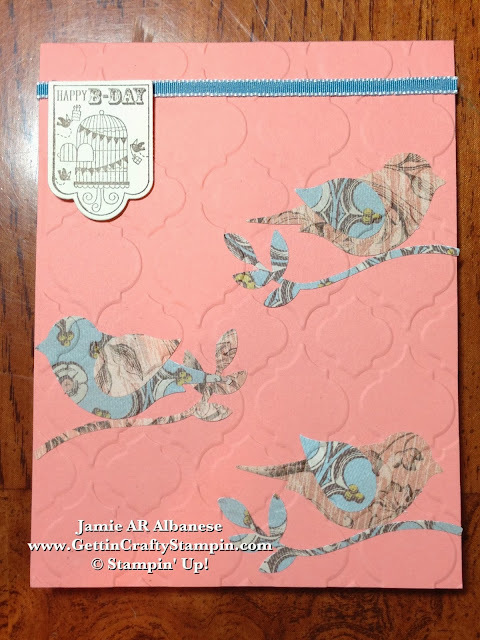 Getting Crafty with Jamie: Happy Bird-Day! Feminine? Vintage?? Natural??? (Check!) I love combining elements for a great, combined look! This elegant card is sure to warm someone's day! Happy B-Day (here 'B' stands for Bird - lol). What do you think? Leave me a comment and let me know! Share this, Pin, Email, Facebook, Tweet, Google+ and Follow Me on those avenues, YouTube, Instagram, The Vine, too! Inspired by one of my favorite papers, Soho Subway (#130140) and this new, cute Hostess Exclusive Perfect You stamp set (#131877). 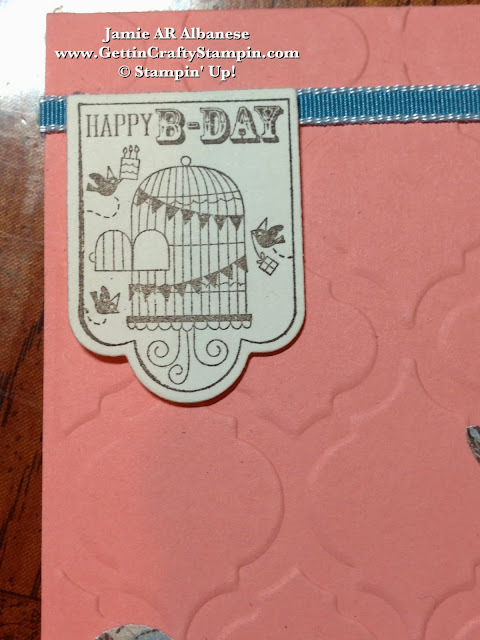 With Crisp Cantaloupe card stock (#131298) as the base, this warm card takes on a vintage vibe. This stunning paper is oh so elegant and patterned to look vintage and feminine. Our Bird Builder punch (#117191) allows this punched image to alternate the sides for contrast. Mixed patterns are all the rage and these are designed to be coordinated - making me look cool - oh so easily! This Hostess Exclusive Perfectly You stamp set (#131877) is pretty awesome, coordinates with the Hearts A Flutter Framelits Dies (#130159), the Big Shot Die-Cutting Machine (#113439), Big Shot Magnetic Platform (#130658). Here stamped with Early Espresso ink (#126974) on Very Vanilla card stock (#101650) for a sharp looking image that coordinates with this paper. The vintage looking stamp lays over this Taffeta Ribbon so it reminds me of a hanging sign. 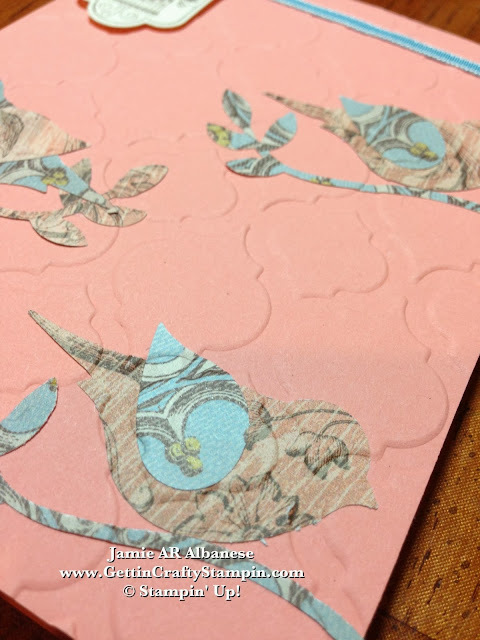 Here the branches come off the side, the birds are created with cool patterns and looks, adding a textured feel with my Big Shot and the Modern Mosaic Embossing Folder (#129984) resembles a trellis you'd see birds living on while adding a fun texture and additional pattern to the card. Go for it! Take on multiple challenges... as it is, people aren't usually one-dimensional. I love that this card reminds me of something Victorian, covering multiple textures, materials and patterns, nature, vintage, feminine... so multi-dimensional! Celebrate a Happy Bird-Day with someone and tweet them some cheer!